Enjoy the intensely physical and mentally rejuvenating fitness classes you love back home with hands-on instruction and concentrated attention from our most experienced instructors. Our retreats provide a chance to get away from the obligations and distractions of daily life and delve deeper into your practice. Kick back by the pool, sharpen your fitness skills and connect with like-minded people. Your hotel is located right off the ever vibrant Plaza de Armas. Upon arrival, we will be met at the airport and transferred to our hotel. Rest and relaxation are encouraged today as the city sits at an elevation of 11,000' and most of us will be feeling the effects of the altitude. We will gather at lunchtime for a short walk through the historic city center to enjoy a light lunch. Later in day we'll gather to visit a little-known Incan archeological site on the outskirts of the city where we’ll share an evening meditation before heading back into the city for our Welcome Dinner. Spend the rest of the evening connecting with the group or retire early. Overnight: El Mercado in Cusco. Weather permitting, we will workout surrounded by the ancient walls of Sacsayhuaman. After breakfast and a relaxing group flow, we will explore the ancient city of Cusco as a group. Our City Tour begins with a visit to the Temple of the Sun at the Korikancha, followed by a walk back to the Main Square (Plaza de Armas) to take in the impressive cathedral at its center. 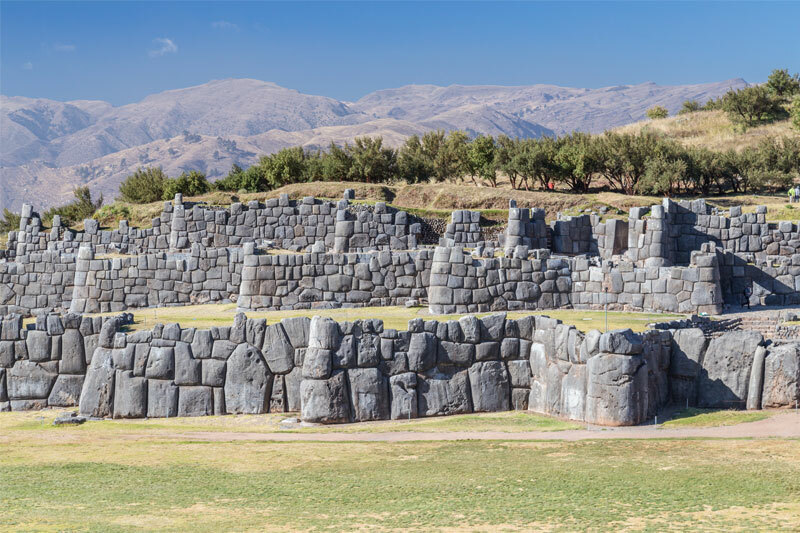 We then travel to the edge of the city where we’ll visit the Inca sites of Q’uenqo, Tambomachay, Puca Pucara, as well as the impressive fortress of Sacsayhuaman, which is built strategically on a hill overlooking Cusco. A pleasant walk downhill and back into town delivers us to a late lunch and an afternoon at leisure before we reconvene that evening for a pre-dinner mat session. Half of our group will also be attending a short briefing to prepare them for the next leg of their adventure, as they will be departing for the Sacred Valley the following day. The streets of Cusco beckon you to lose yourself - both in spirit and local. We'll start the day off at a relaxed pace, enjoying breakfast and a morning fitness session followed by time to freshen up before embarking on today’s adventure: a journey into the world Peruvian cuisine! Try your hand in the kitchen during a 3-hour course designed to offer unique insight into Peru’s agricultural heritage and ancient culture through the use of regional products like quinoa, yellow peppers, and trout. The class starts with an opportunity to shop in Cusco’s traditional open-air San Pedro Market followed by a trip to a Rooftop Kitchen where breathtaking views of the city are combined with a lesson in delicious gourmet fusion dishes. As a class we will prepare an appetizer, main course, and pisco sour to enjoy for lunch upon completion. Afterward we’ll retreat into an afternoon meditation practice, paired with a bit of free time to enjoy a massage or wander local shops before dinner. Activities: Morning fitness, cooking class, afternoon meditation. The kindness of the locals is ever more vibrant than their attire. This morning we enjoy an early morning fitness session before heading into the Sacred Valley to start a full day of exploration. The town square is often the center of activity throughout this region, but so too is the town market. And none is more alive than the famous market at Pisaq. Choose to spend the morning exploring this wonderful community where a unique array of products will inspire you with a small taste of the rich culture yet to be explored on your journey. Or if you prefer to seek today's inspiration in nature, you can instead opt for an invigorating morning hike surrounded by amazing views of the Andean peaks that stand guard over this magnificent valley. At midday we'll regroup high above the valley for exclusive access to the isolated community of Viacha. Together we'll learn about their age-old artisanal potato farming practices before sharing in a Pachamama ceremony (a sacred Andean ritual used by the local people to offer thanks to Mother Earth) and a traditional Pachamanca lunch featuring delicious meats and vegetables cooked in under hot stones. After lunch, our group will visit the archaeological complex at Pisaq where we'll enjoy a guided meditation in addition to exploring the Incan complex free of the morning crowds. By late afternoon we'll arrive at the Lamay Lodge where you can opt for an afternoon wellness class or perhaps choose to instead indulge in a massage or a soak in the lush garden hot tub. Hike: From the local community of Amaru to the local community of Viacha / Duration 2.5-3 h. / Moderate / Mountain pass at an elevation of 14,200´ - 4,328m. Group Activity: Group lunch at the local community of Viacha. In the afternoon, the whole group visits the archeological site of Pisaq, before heading to the lodge. An evening wellness class is available, or enjoy the lodge amenities. The high altitude mountain views are unparalleled. Enjoy an early morning group fitness class before setting out for the day to explore the rich Andean tapestry of the Lares Region. Traveling into the heart of the Lares Valley, our group will enjoy a scenic drive along the celebrated “Inca Weaver’s Trail,” including a stop at the remarkable, yet little-visited archeological site of Ancasmarca located not far from the hub-town of Lares. 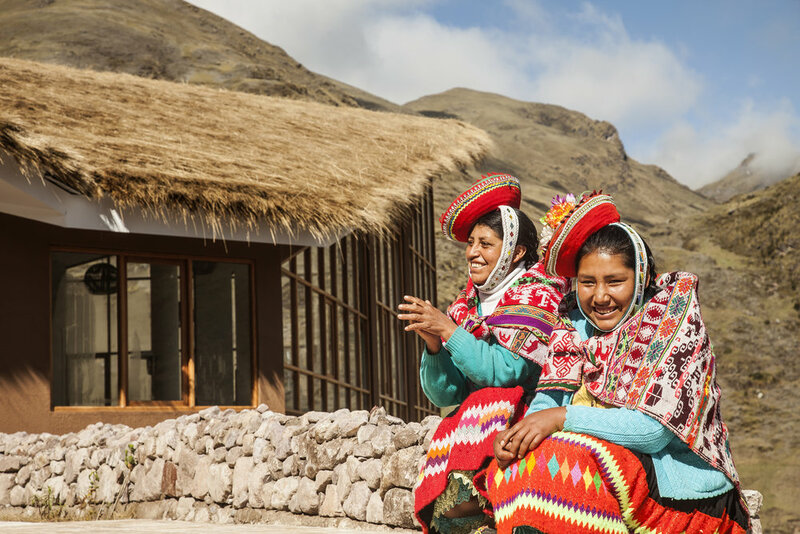 From here, those who wish to get an up-close look into traditional life in remote Peru will visit the ancient weavers’ village of Choquecancha for an opportunity to connect with local women and see first-hand the painstaking work behind the stunning textiles their communities have become famous for. Meanwhile those who prefer a day of hiking will hit the trail, walking in solitude amidst turquoise blue lakes and towering peaks until reaching the remote village of Huacahuasi, our evening destination. Lunches will be served en route, with the night spent at Huacahuasi Lodge, an innovative joint venture with the local community. Specifically designed to help protect the cultural heritage of the local community and the environmental health of the surrounding area, this unique partnership provides a sustainable source of income to the local people while offering guests rare insight into the evolving lives of the original Andean people, both in terms of their culture and in terms of their place in Cusco's modern-day commerce. Here you can also enjoy an evening massage or soak in your personal hut tub under the stars. Group Activity (morning to noon): In the morning, explore the town of Lamay and visit the archeological site of Ancasmarca. Cultural activity: Visit the town of Choquecancha, meet with local weavers and experience an encounter with members of community. Hike: From Quelqena to Huacahuasi / Duration 2-2.5 h. / Easy to moderate / Mountain pass at an elevation of 12,595´- 3,839 m.
Hike: From Cuncani to Huacahuasi / Duration 3.5-4 h. / Moderate / Mountain pass at an elevation of 13,838´- 4,219m. Note: Guests that opt for the cultural activity will have lunch at the local community of Choquecancha. Guests that opt for the hikes will have lunch en route. Enjoy the warm waters of the outdoor hot tub each night at the lodges. After breakfast, we'll spend some time learning a bit about the heritage and day-to-day activities of the Huacahuasi community. From here, you’ll have a choice for how to spend the day. Hikers can choose to embark on a spectacular trail that runs over a high mountain pass into an adjacent valley, eventually leading to the ancient town of Ollantaytambo (the oldest living city in Latin America). Or for hikers preferring a little less intensity, there’s also a shorter option to hike from Lares Pass along an authentic Inca trail leading deep into a beautiful canyon and finally ending at the Local Community of Totora. For those who prefer to see more of the Sacred Valley, you can drive back for a visit to a wonderful ethnographic museum featuring a dramatic presentation on the history of Peru’s rich civilizations. Afterwards, lunch will be served in the Urubamba River countryside followed by a visit to Ollantaytambo town, where you can spend the afternoon meandering its charming maze-like streets. We'll all gather together again late in the day for an outdoor fitness class in the gardens of our next lodge before sitting down to dinner. Cultural activity: Drive back to the Sacred Valley of the Incas, visit a local farmer’s market and a Pre-Inca and Inca cultural museum. Enjoy a Barbeque for lunch at Kuychi Rumi Lodge and in the afternoon explore the town of Ollantaytambo. Inca Trail hike: Beautiful hike from Lares pass to the village of Totora / Duration 3 hrs. / Easy to moderate. Enjoy a Barbeque for lunch at Kuychi Rumi Lodge. Hike: From Huacahuasi to Patacancha / Duration 7 h. / Moderate to challenging / Mountain pass at an elevation of 14,646’ - 4,464m. Route lunch at Ipsaycocha lake. Afternoon arrival in Ollantaytambo. Note: Guests that opt for the cultural activity and guests that opt for the Inca trail hike excursion will meet for lunch in Urubamba at a countryside restaurant and visit the town of Ollantaytambo together in the afternoon. Guests that opt for the Huacahuasi to Patacancha hike will meet up with the rest of the group late in the afternoon at Kuychi Rumi lodge in Urubamba. Reaching the Citadel of Machu Picchu will leave us awe inspired. Start the day with an early morning fitness session in the garden before breakfast. From here, we'll head off to the temple ruins of Ollantaytambo, one of the most important ceremonial centers for the Inca (first as the royal estate of Inca-Emperor Pachacutec and later as a stronghold against the Spanish conquistadors for Manco Inca Yupanqui), where we'll receive a thorough introduction to its mystical history and the strategic architectural planning behind the design. The sense of awe that overtakes you here will be the perfect introduction to our next stop... Machu Picchu! A late morning scenic train ride along the famous Urubamba River will deliver us to Aguas Calientes, the town below Machu Picchu, by the early afternoon. A short, rollicking bus ride uphill from the train depot will deposit us at the gates of the “Sanctuary” (as locals refer to it), where we'll enjoy our first views of the world-famous Incan ruins. Prepare to be awed by the imposing and skillful architecture of the Watchtower, the Temple of the Sun, and the royal Inca residences, among many others. You might even take a moment to quietly sit and listen to the wind…or to meditate and absorb the mystical energy that envelops you. Your imagination will soar as you contemplate the history of Machu Picchu and its mysterious origins. And thankfully our late arrival ensures we have the best chance to enjoy a quiet window away from the crowds, as most visitors arrive into the complex in the early morning and begin to leave by lunchtime. Train: Ollantaytambo - Aguas Calientes / Late morning train / Duration 1h30m approximately. Overnight: Inkaterra Pueblo Hotel, located in the town of Aguas Calientes (el. 6,232´- 1,900m. ), the base town of Machu Picchu. Connection is the root of all travel. This morning you will return to Machu Picchu for one more look around the complex and, for those who choose, a hike up Huayna Picchu (the iconic towering mountain often seen in photographs for its dramatic views that stretch from the Urubamba River valley to the edge of the Amazon Jungle). Either way, the morning will leave you with a sense of peace and rejuvenation which will linger even as you board the train back to the city lights and hustle of Cusco. After a late day arrival back in the city, we will have the chance to clean up before enjoying a celebratory Farewell Dinner in a local hot spot. Group Activity: Early in the morning, visit the Inca citadel of Machu Picchu. Cultural Activity: free time to explore the Inca citadel of Machu Picchu (el. 7,872´ - 2,400m.). Hike: Guided hike of Huayna Picchu Mountain / Duration 2-2.5 hs. / Moderate to challenging / Mountain pass at an elevation of 8,924´ - 2,720m. Train: Aguas Calientes - Ollantaytambo / Early afternoon train / Duration 1h30m approximately. Transfer: Ollantaytambo - Cusco and drop-off at hotel (arriving approximately at 6pm). After breakfast and a final group fitness class, we say our final farewells. Our time in Peru will leave your rooted to your inner self, fellow travelers and a deeper wellness practices. El Mercado is a 4-star property located three and a half blocks from the Plaza de Armas (Main Square), the heartof picturesque Cusco. Formerly part of the city’s old farmer’s market, El Mercado’s 32 rooms and quaint atmosphere guarantee personal and friendly service, and will inmediately immerse our guest in the cultural and historical traits of Cusco and Peru. Accommodations along the Sacred Valley and Lares Adventure are located both in remote places as well as in traditional towns, yet always surrounded by stunning sceneries and local living culture. As a reference, all the lodges are comparable to a 4-5 star property. The following information might be useful for additional things to expect. If you have any questions about the accommodations, please contact your Travel Specialist. Complimentary internet is available in every room. Each room has a safety deposit box. Toilet equipped with hair-dryers and full amenities. There are 110V compatible sockets in the lodges (220V is the official voltage). K’uychi Rumi offers an exclusive lodging alternative for your stay in Peru. It consists of seven luxurious and individually designed rustic Andean lodges surrounded by beautiful gardens and native fruit orchards. The property is nestled at the foot of some of the most picturesque mountain peaks in all of Peru and is within short distance from the Urubamba River. Located outside the quaint town of Urubamba in the Sacred Valley of the Incas. We are one hour away from the historic and world famous city of Cusco. We are half an hour away from the train station to the unforgettable one-hour scenic ride to Machu Picchu. Other nearby historical sites and cities include Pisac, Ollantaytambo, Chinchero, Maras, Paucartambo, and Manu National Park.